This is a story of two friends – Katrina and Deepika. Both of them got married in the year 1980. Katrina comes from a conservative family whose members mostly “invest” their hard-earned money in a bank fixed deposit. The reason was simple – fixed deposits are “safe”. There is no fluctuation and you consistently earn interest every year without fail. Katrina was always told that investing elsewhere was a gamble and it is best to be in the safety of fixed deposits. At the time of her wedding, she received Rs. 100,000 from her parents to be used for the wedding of her child. She promptly invested this sum in a fixed deposit and renewed it every year. She was quite happy and at peace that she would be able to take care of one of her major responsibilities in life. Deepika is a lot like Katrina except that she had somehow heard and ended up reading about Warren Buffett, a man who had made millions investing in businesses listed on the stock exchanges in the USA. Like Katrina, Deepika also received a sum of Rs. 100,000 from her parents to be used for her child’s wedding. Since the goal for which she was investing was in the distant future, Deepika invested this money in the Indian equity markets, i.e. an index fund replicating the Sensex. What is most staggering about the above chart is that starting with the same sum of Rs. 100,000 both ended up having vastly different results. To bring home this point, let’s compare how much gold would they have been able to buy in March 2015 as compared to 1980 when they got married. In 1980, both Katrina and Deepika would have been able to buy about 750 grams of gold with the Rs.100,000 that their parents gave them (gold price at the time was around Rs. 1,330 per 10 grams). However, by 2015 gold prices had increased to Rs. 26,500 per 10 grams. Katrina’s investment of 100,000 increased to Rs. 21.70 lacs with which she would have been able to buy 820 grams of gold in 2015 (not much better than what she would have been able to buy in 1980). In other words, even though Katrina had more money in 2015, she barely had an increase in purchasing power. Delaying her purchase of gold did not give her any real advantage. She might as well have bought 750 grams of gold in 1980 and sat on it. It would not have made much difference. On the other hand, Deepika’s investment had grown to around Rs. 2.2 crores by the end of financial year 2014-15. With that kind of money she would have been able to buy an astounding 8.2 kilograms of gold. Yes, 8.2 kilograms of gold – 10 times more than Katrina! Agreed, Katrina had a smoother ride than Deepika – Deepika experienced quite a few fluctuations in her investment journey. 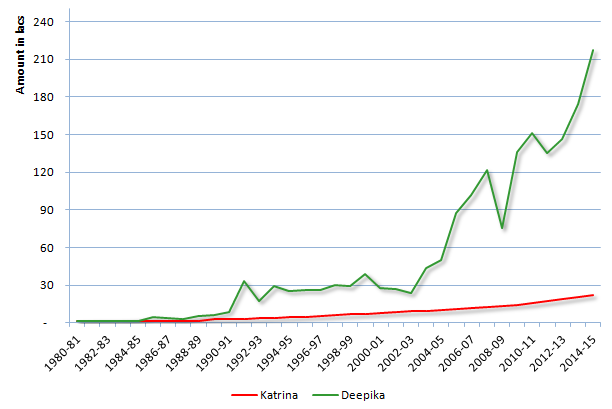 But, even with those fluctuations, she fared much better than Katrina. Wait; there is more bad news for Katrina! The returns that have been considered are only pre-tax returns on fixed deposits. In case taxes are taken into account, the returns on the FD would have been worse. Just to give you a perspective, if an average tax rate of 30% is assumed, the value of Katrina’s investment at the end of 2014-15 would have been a paltry Rs. 9 lacs. She would have been able to buy only 335 grams of gold in March 2015 compared to 750 grams in 1980. Thus, by “investing” her money in a fixed deposit, she suffered an erosion of more than 50% in her wealth. Further, any dividends that Deepika would have received from her investment have also not been considered for sake of simplicity. Had the same been included, her investment results would improve, in turn widening the gap between Deepika’s and Katrina’s investment returns. Investing in Bank fixed deposits may not be volatile, but you would be well advised not to equate “volatility” with “risk”. They are two very different things. And as it turned out, the investment with negligible volatility ultimately ended up being the one with more risk. Don’t you think it is wise to think in terms of purchasing power instead of paper money? What should be a bigger cause for worry – loss of purchasing power or temporary fluctuations in an investment? In the end, do you think Katrina would be filled with regret about her decision to invest in an FD? Would knowing Deepika’s investment result change anything? I think it’s time we paid heed to his advice.